Brunnthal/Munich, Germany, January 11, 2017 – SFC Energy, a leading provider of hybrid power solutions to the stationary and mobile power generation markets, announces receipt and partial delivery of an order by its Indian partner, FC TecNrgy Pvt Ltd, based out of Gurgaon, Haryana, India. An Indian paramilitary border protection force under the Indian Ministry of Home Affairs has ordered more than 80 SFC Energy products, accessories and more than 3,000 methanol fuel cartridges. The Indian paramilitary force will be using SFC Energy’s EMILY 3000 and JENNY 600S fuel cells for reliably powering border protection equipment, electrical equipment and, especially, critical communication systems at border outposts, most of which are at very remote and difficult locations. EMILY 3000 is a highly efficient, very silent, environmentally friendly mobile power source for electrical devices in command and multipurpose vehicles, and for fielded and stationary power in field outposts. It powers electrical devices and recharges connected batteries automatically on demand, 24/7, in any season and weather, without user attention. EMILY 3000 consumes approx. 0.1 l methanol per hour. A generator in the same application needs more than 2 l Diesel. Thus, EMILY 3000 enables significantly easier fuel logistics in difficult to access regions, with much reduced operating expenses. JENNY 600S fuel cell is a man-portable, highly flexible fuel cell system. It powers electric devices, e.g. radio or night vision devices. 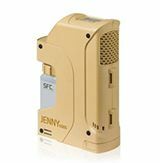 In combination with the SFC Power Manager, JENNY 600S supplies parallel power to different voltage devices and recharges batteries at the same time. SFC Energy’s Methanol Cartridge Refill stations are used for refilling JENNY 600S’ 350 ml cartridges in the field from M10 fuel cartridges. The 10 l cartridges can easily be transported by foot or air freight as posts are often situated far away from any roads. The sustainable, almost completely emission-free operation of the fuel cells is a valuable contribution to protecting the environment, especially in those wild, largely untouched nature areas where the devices are used. Numerous international defense and home security organizations are using SFC Energy fuel cell products. SFC fuel cell and accessory products carry a NATO stock number. Additional information on the SFC Energy’s off grid power portfolio for defense, security & safety, oil & gas, wind, traffic management, environmental and telecommunications applications at www.sfc-defense.com, www.efoy-pro.com and at www.sfc.com.